Apple’s iPhone X is out in the market, and we are hearing lot of things about it. The previous models, iPhone 8 and the iPhone 8 Plus are being compared with iPhone 7 and iPhone 7 plus, in terms of shape and new features. But iPhone X is has changed the perception of an average user in many ways; a phone that looks to the future and is completely different from the iPhones we have come across. The new iPhone X has brought new challenges and opportunities for the iPhone app developers with revamped software and hardware capabilities. iPhone X is the first Apple smartphone with biggest screen comparing to the previous versions by ticking off the home button from its list. These changes in the specifications have made mobile app development companies New York to update their programs specifically for iPhone X. There are plenty of applications have already been optimized. Nike+ Run club is a Health and Fitness app that provides features to improve your running workouts. The app includes features like GPS-tracking, audio-guided running workouts and personalised coaching plans. You can share your workout progress with your friends in different ways. Nike has updated its features that have been optimized for iPhone X to provide better user experience. 1Password is a password manager app that keeps all your passwords in one place. It was upgraded for iPhone X version by adding face detection security to verify person’s identity to grant access. Fantastical 2 is an award-winning calendar app in the app store. It allows users to create reminders for events, and also enables them to share the event details with your friends. This iPhone calendar app looks great, works great, and now has been integrated with iOS reminders. The app was updated for iPhone X for better display. Mint is one of the most popular finance apps that allows hassles-free money management. You can manage all your money accounts from a single device using this app. All your bank accounts, credit cards, bills and investments will be loaded in to this app. The app was recently upgraded to new version where users can access app with FaceID, particularly for iPhone X. Buffer is a popular app for marketing agencies where one can manage all social media sites in one place. With Buffer app, users can create posts on all social media platforms and schedule them to be released later. At present, Buffer supports FaceID to verify user’s identity before accessing to their social media accounts. Google Photos is a cloud-based photo app where users can upload, download the photos in to Google drive and access the photos from cloud itself. Google photos has been optimized for iPhone X’s new aspect ratio to let it use the entire screen. With Weather Atlas app, user can see weather forecasts and live radar. You can also add location preference to your app to see weather information for a particular location. This app has also been upgraded for iPhone X bezel-less display. Super Mario is one of the most popular video game in the Apple app store. The user can control Mario through tapping on the phone. In the recent update, modifications have been made so the game properly fits the iPhone X screen. 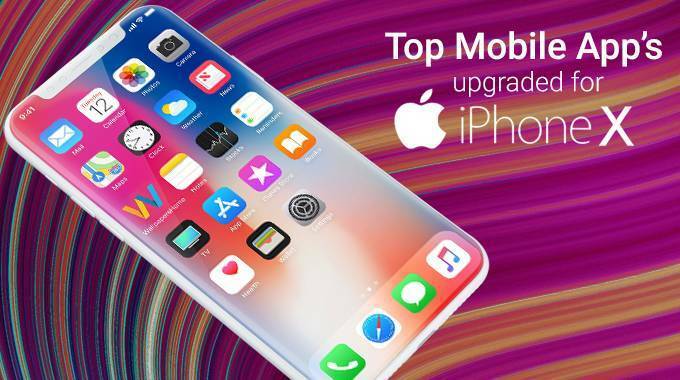 These are few popular mobile apps that are upgraded in their recent updates to utilize all new features provided by the iPhone X. There are many iPhone app development companies New Jersey working to launch different kind of apps that will be supporting iPhone X.